Vistas deslumbrantes da montanha e vistas deslumbrantes do rio abundam nesta loja de uma cabine que é uma verdadeira definição de "longe de tudo". Cada vista é de tirar o fôlego começando com o seu café e um nascer do sol na varanda de trás com vista para o rio Madison, onde você vai ver pescador tentando domesticar um dos melhores rios de truta do mundo com seu talento. A cabine com seus logs quentes e convidativos e pisos de madeira tem uma grande sala abobadada com uma grande lareira de pedra que aquece a sua experiência como você tirar a vida selvagem do seu refrão acolhedor. Grandes varandas para relaxar e uma cozinha ao ar livre mantê-lo um com a natureza, mas as comodidades modernas da cozinha interior pode mantê-lo cozinhar dentro com os aparelhos mais modernos e todos os confortos de casa para roubar refeições para seus cowpokes. Com 3 quartos um dos quais é um grande mestre com varanda privada e sótão para um espaço de trabalho acolhedor e uma cama loft adicional e porão cheio, há muito espaço para todos os seus cowboys e meninas. Wi-Fi e TV de tela grande estão no pronto para sua multidão interna também. 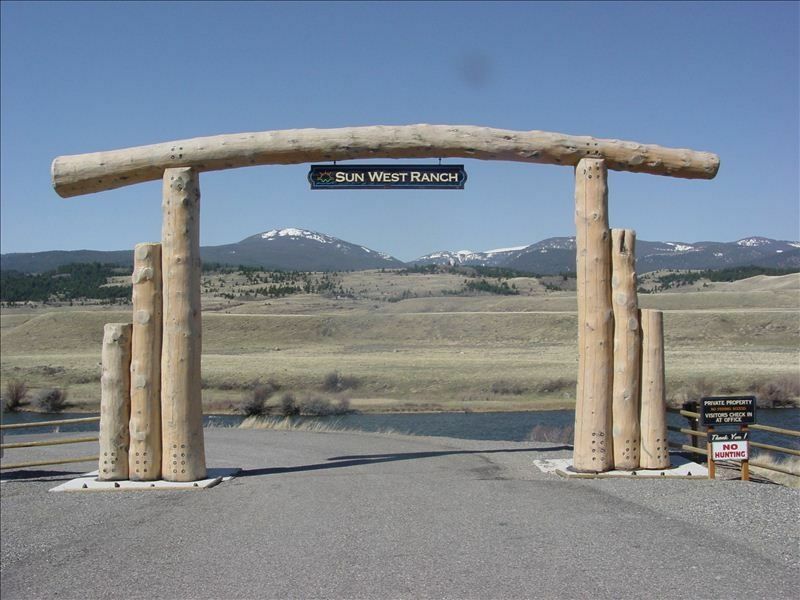 Sunwest Ranch é uma fazenda privada com casas lindas e vistas inigualáveis das cadeias de montanhas próximas. Em 5000 pés você vai se sentir no topo do mundo e uma parte da montanha e ver a vida selvagem como rebanhos de Elk e um Alce ocasional fazem deste um lugar como nenhum outro. Há muito disponível para fazer com snowmobile, caminhadas, flutuando no rio, lagos próximos para pescar ou fazer piquenique, bem como Antiquing na histórica Virginia City e, claro, passeios de um dia para Yellowstone National Park e Big Sky oferecem coisas divertidas para fazer, não importa o que época do ano! A experiência de Montana é realmente 'GRANDE' e ter sua própria cabine no topo da montanha não fica muito maior. We loved the house and surroundings. We had 6 adults and 6 children and we had plenty of room. The owners were very helpful and friendly when we had an issue and answered right away. The ranch staff was also very friendly and helpful. We would stay there again!! Our stay at this cabin was absolutely amazing! We stayed for over a week and had a fantastic time enjoying the views and cozy feel of this place. You can't beat being this close to Yellowstone National Park and Big Sky ski resort while also having a private getaway place to stay after having a day full of fun. The cabin was clean, warm and cozy, everything that we could have asked for in a winter stay in beautiful Montana. Would absolutely come here again and again! Also the renters Kim and Gary we so nice and helpful recommending places and things to see while staying at their amazing log cabin. Great place for family reunions and special occasions. Lots of room to roam around inside and out. Never felt crowded even with 9 of us. Great view of Madison River; so quiet, safe and peaceful. Visited Ennis, Verginia City, Yellowstone Park, Grand Teton, Mesa Falls, West Yellowstone and so forth. Viking stove and burner top worked like magic, hot tub was a nice bonus. Owner Kim was wonderful and very flexible to work with. Wish we could have stayed longer. It was hard for us to leave. Would definitely go back and stay again when the right opportunities present themselves. Thanks for the wonderful memories. We stayed at this home in June/July. The weather was wonderful, cool at night and in the morning and sunny and warm during the day. This beautiful house is roomy and can easily accommodate 12 – 14 people. In addition to the fully equipped kitchen, there are 3 bedrooms on the main floor, a loft bedroom, and a basement area that has bunk beds and sleeping sofas. The living area on the main floor and the basement area were wonderful for family time - plenty of seating and large screen TV's. During our stay we went fly-fishing on the Madison River; took an overnight trip to Jackson Hole where we went to the rodeo; went to Yellowstone where we saw Old Faithful as well as moose and buffalo roaming along near the road; and we visited Ennis on July 4th for their parade and car show. This home was the perfect destination for relaxation, sightseeing, and the Big Sky experience. Our hunting group stayed in this awesome "cabin" last fall and we were very impressed to a man with the no expense spared yet still rustic feeling to this house. Everyone had their own space, with all the modern amenities of today's lifestyle. We plan on staying in it again this fall. We totally recommend it. The listing photos really do not show how nice this cabin really is. The owners have been fabulous to visit with and Very helpful with any and all questions we had. Thanks very much Les for this kind review! I am updating with newer pictures now and please send me your dates and I will block the calendar for your group for this years outing! The ranch staff even commented as to how wonderful your group was and we are so glad your trip was enjoyed by all! Guests must sign in at ranch office upon arrival and agree to follow rules of the ranch for duration of stay. Must sign rental agreement at booking, 1 vehicle included in rental additional vehicles are a charge of $50.00 each vehicle and r3enter must notify owner of this in advance.